Soldiers, ready to battle the legions of red-eyed boaters. A day spent in preparation, is a day well spent indeed. 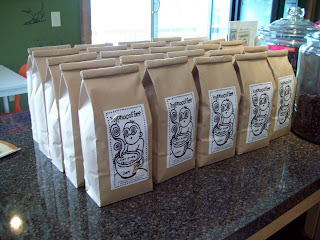 I roasted forty (40) pounds of coffee for the Director to take to Cheat Fest tomorrow ( http://cheat.org/festival/ ). As a special treat to attendees at this year's festival, today's roast was a special melange consisting of Sumatra Mandheling roasted to full city + perfection then mixed with Costa Rica Tarrazu given the city roast treatment. After being roasted I mixed them together and viola! a new blend is born; Cheat River Festival Blend. Bish and I cupped the concoction and we were both very impressed; bright, dark berry flavors, rich body, and a smooth finish. Oh man, there will be some lucky hung-over boaters this weekend, the Director included. For good measure I held onto six (6) pounds of the commemorative blend for our in-house consumption this weekend. If we can't attend Cheat Fest, at least we'll drink like we did. You are all very welcome. The weather looks threatening at best, so pack a slicker and stay warm with Hypno in your mug. Thanks to Mike and Willie for filling a keg with water and to Al for the simpler coffee brewing system this year. Last year's attempt had its fair share of snags, but hopefully we eliminated a couple of the major issues this time around. Many of you have already volunteered to check on the Director and one (1) of you agreed to slip him the Antabuse. The fun follows shortly there after. 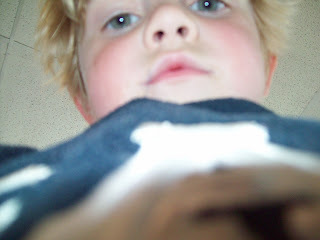 Charlie is figuring out how these cameras work.